PMO & PBC NEEDS YOU NOW! Click here: http://www.payatasmissionoutreach.org and look for the “subscribe box”” you can also read about all PMO, through our supporters, does to support PBC! PMO is a 501 (c) 3 Non-Profit Organization and we do mean non-profit! That’s why we are asking you to help bring the Gospel of Christ to the Payatas! We have a 20 year plan. We preach the Gospel to the children (adults too but we focus on the children) They start coming to Church where we also make sure they eat, have clothes, get their birth certificates so we can register them for school. (Many have not gone for years) Buy their uniforms, school supplies. We teach them in advance at the Church so when they are being taught in school they are ahead of the class. Some classes have 80 students and it is impossible for the poor teachers to cover them all so they also appreciate us. Music: We use music to help them advance. The statistics show, those involved with music are 50 % more likely to graduate college. We have violinists, guitarists, flutists, organists and even have ukulele players! They first learn to read music and then learn an instrument. Once they can play and read two songs, we give them an instrument. beautiful music they have confidence and they will soar! Our children are monitored for their development and sincerely love to learn and to do well. Their parents boast that they help around the house and are generally more responsible. Our first two children (adults now) are graduating college and will go on to advance studies. They look forward of staying with the Church and helping others to grow like they were helped. That’s the 20 year plan. We look forward to many of these children graduating college in time and giving back to the Church. We are looking forward to be a self-sustaining operation but until then we NEED YOU NOW. Will you join us as monthly supporters so that we can continue to do a good work here? PLEASE! WE NEED YOU NOW! CLICK THE LOGO ABOVE NOW AND JOIN US! The link will bring you to a page where you can send your donations by check, money order, paypal with your debit/credit cards, or you can make Direct deposits to our Bank of America acct # 0621811115 Payatas Mission Outreach, Inc.
You can also direct deposit to China Bank: Payatas QC Baptist Church & Ministires inc. China Bank Don Antonio acct # 2390024516. 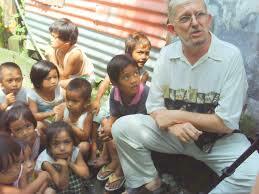 NOW, is the time to help children grow in Christ and be able to get out of the Dump site. Pro 21:13 Whoso stoppeth his ears at the cry of the poor, he also shall cry himself, but shall not be heard. We look forward to partnering with you. For all of you already on the team, the kids appreciate and pray for you. This month we bought clothes for some of our little ones graduating. We had our friends and family Day. We have blessings from Canada of p4000 to help feed the poor. VBS is this month. It is less costly this year because we are using the older kits and our people are trained. So we went from close to $400 to only $200. We received a donation of $100, only $100 more needed.